Killearn Acres is one of the most popular neighborhoods in Tallahassee and typically is in the top five or six in terms of the number of homes that sell each year. Located just north of Killearn Estates, it has been popular due to its location and price point (just above Tallahassee's median home price). 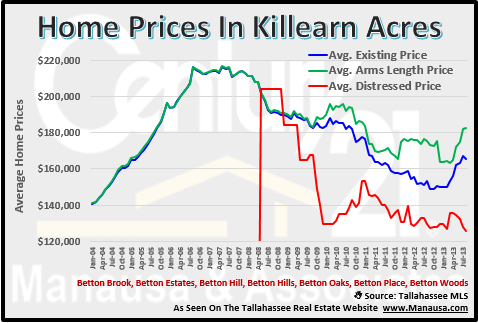 As with all subdivisions in Tallahassee, Killearn Acres is seeing real estate depreciation bring home values down.The current average home price is just under $158, and the average price per square foot of homes that have been sold this year is down to $93. This has created some wonderful home buying opportunities for both owner occupants as well as real estate investors who crave the stability that tenants in this Northeast Tallahassee provide. With a young-family make-up, Killearn Acres tenants often stay far longer than those in student rentals on the south side of the Tallahassee real estate market. Home sales in Killearn Acres are on pace to see about the same number of sales in 2011 as were recorded in the low record-setting 2010. Currently, there are 22 homes for sale in Killearn Acres in the Tallahassee MLS, priced from $119,900 to over $700K. 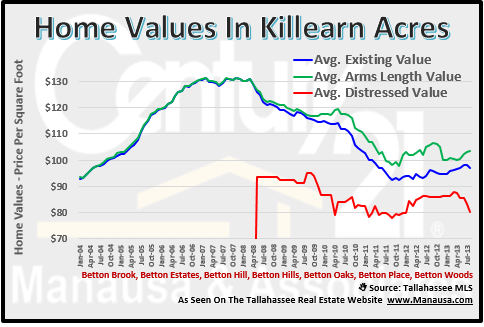 Home values in Killearn Acres have fallen a bit faster than home prices, meaning buyers have been gravitating towards the larger homes. This is not uncommon around Tallahassee, as low interest rates have enabled purchasers to get a lot more house for the money.